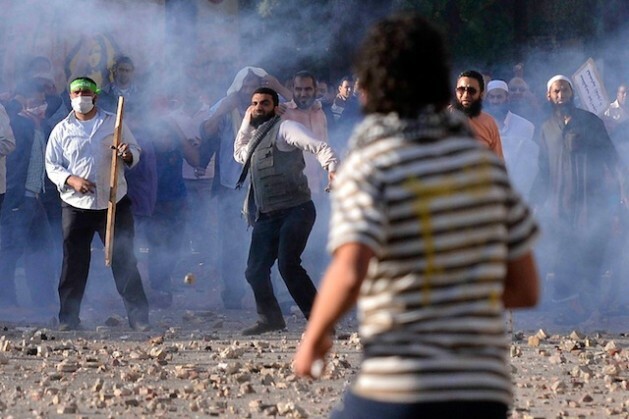 A street fight in Cairo over ousted Egyptian president Mohammed Morsi. Credit: Hisham Allam/IPS. CAIRO, Aug 16 2013 (IPS) - As Egypt’s political crisis escalates, supporters of ousted president Mohamed Morsi accuse the local media – both state-run and private – of ignoring pro-Morsi demonstrations and covering up massive rights abuses. On Wednesday, Aug. 14, security forces in Cairo violently dispersed two six-week-old sit-ins staged by protesters demanding Morsi’s reinstatement. Using live ammunition and teargas, they eventually managed to clear both protest sites. As of Thursday night, Aug. 15, Egypt’s health ministry put the number of those killed in Rabaa al-Adawiya Square – the larger of the two pro-Morsi sit-ins – at 288. The pro-Morsi National Alliance for the Defence of Legitimacy, however, puts the number in the thousands. The veracity of either figure remains impossible to verify at this point. At least four journalists – including a foreign cameraman for British Sky News – were killed in the violence. The move ignited nationwide clashes between pro-Morsi demonstrators and security forces, the latter often in plainclothes. A number of police stations throughout the country were ransacked and torched. The state press, meanwhile, along with most private Egyptian media outlets, praised the security operation against the “terrorists” who had “threatened national security.” Egyptian television showed weapons it claimed had been found at the two protest sites. “Local media has consistently tried to paint peaceful demonstrators as violent terrorists without producing credible proof of its claims,” said al-Arabi. Reports of alleged weapons found at the two sit-ins, he asserted, had been fabricated by security forces in cooperation with a compliant media. Since Morsi’s Jul. 3 ouster by the military, nationwide demonstrations demanding his reinstatement have remained largely peaceful in nature, with protesters frequently repeating the chant “Salmiya”, which means “Peaceful”. Egyptian media has also tried play down the numbers of – or entirely ignore – the ongoing series of demonstrations by the ousted president’s supporters. Hasan Ali, professor of media at Cairo University, supported al-Arabi’s view. “Egyptian television is completely ignoring our demonstrations in hope of convincing the public there’s no popular opposition to the military coup,” Mahmoud Sallem, a 30-year-old engineer and pro-Morsi demonstrator told IPS from the Rabaa al-Adawiya sit-in shortly before its dispersal. According to the Brotherhood’s al-Arabi, who is also a member of Egypt’s Supreme Council for Journalism (responsible for the administration of the state press), said the ongoing news blackout on pro-Morsi activity was part of a larger media campaign against Egypt’s Islamist camp. “After the coup, the state press immediately stopped publishing anything by Islamist-leaning writers, while all state-run television channels – and most private ones – stopped hosting Islamist-leaning guests,” he said. Following Morsi’s ouster last month, authorities immediately closed all Islamist television channels, accusing them of “inciting violence”. Security forces also raided Al Jazeera’s Cairo offices, similarly accusing the channel of broadcasting “incitement”. Prominent private channels known for pursuing a vehemently anti-Islamist line, were left untouched. Based in Egypt’s Media Production City on Cairo’s outskirts, these channels are owned largely by prominent businessmen known to have close associations with the ousted Hosni Mubarak regime. Early this month, dozens of pro-Morsi demonstrators were arrested when they attempted to stage a sit-in outside the MPC to demand a “purge” of the media. Meanwhile, the small handful of non-Egyptian television channels covering the pro-Morsi demonstrations has been subject to frequent harassment and interference. On Tuesday night, Aug. 13, the Gaza-based Al-Quds television channel reported that its Cairo office had been raided and an employee detained by Egyptian security forces. Al-Quds, one of very few channels covering pro-Morsi demonstrations, is run by Palestinian resistance group Hamas, an ideological offshoot of Egypt’s Muslim Brotherhood. Last year, Morsi – the Brotherhood’s candidate – became the country’s first-ever freely elected president. On Jul. 3 of this year, he was ousted by Egypt’s powerful military establishment after massive protests against his administration in Cairo’s Tahrir Square. Aside from Al-Quds, the few other channels covering pro-Morsi rallies – including Al Jazeera, Jordan-based Al-Yarmouk and London-based Al-Hiwar – have all seen their signals scrambled in recent weeks. The Al Jazeera channels that frequently cover pro-Morsi rallies, especially the network’s 24-hour live Egypt channel, Jazeera Mubasher, all remain subject to frequent interference. The fight for the airwaves has taken on an international dimension. Ali pointed to an ongoing “media war” between Al Jazeera, based in Muslim Brotherhood-friendly Qatar, and the Saudi-owned Al-Arabiya, based in the staunchly anti-Brotherhood United Arab Emirates (UAE). On Wednesday, the UAE voiced its full support for the “sovereign measures” taken by Egyptian authorities against the pro-Morsi sit-ins. Despite a government-declared state of emergency, the Brotherhood-led National Alliance for the Defence of Legitimacy has called for more demonstrations on Friday, Aug. 16. Along with Morsi’s reinstatement, demonstrators demand the restoration of Egypt’s suspended constitution and dissolved Shura Council (upper house of parliament) and the prosecution of those responsible for killing peaceful protesters.